The floor plans of the ‘studio cube’ and the ‘residential cube’ both feature on the ground floor and on the first floor a central corridor with rooms on either side: two bedrooms, a music room, library with a fireplace, a bathroom, shower and a kitchen. The music room and the library both abut the studio and have pivoting walls which are black on the corridor side and grey on the side of the rooms. 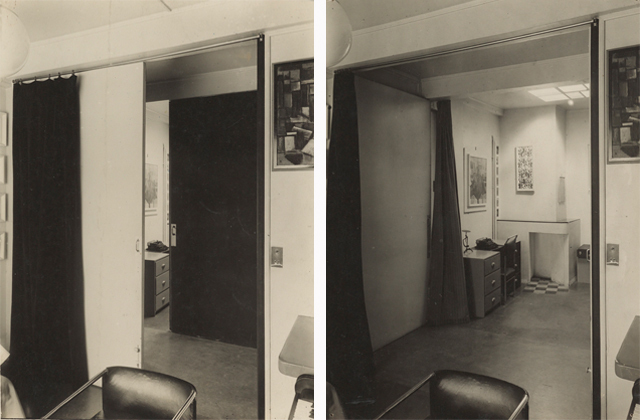 When they are open they separate the studio from the corridor and a space is created that is perpendicular to the corridor. When closed, they partially shut off the rooms. The front entrance is on the first floor. The corridor there leads to the studio which occupies the entire width and height of the atelier studio, with two windows several metres in height on the north. A concrete staircase in the studio accesses the ground floor and a steel staircase leads to a landing accessing a roof terrace with a southerly aspect. Under the elevated studio there is a shaded terrace beside a garden accessing the kitchen. The corridor on the ground floor leads to the (former) garage and storage space (converted into a shower room) at the front of the house. 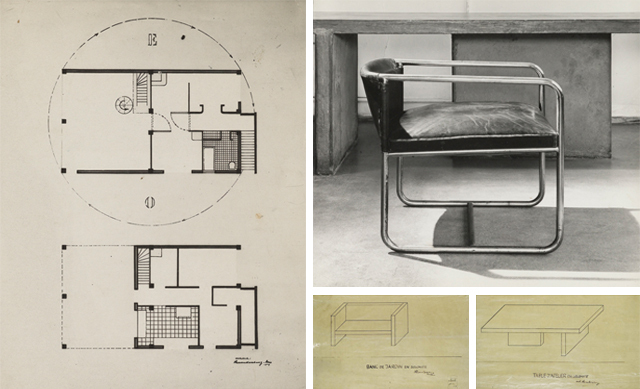 Floorplan ground and first floor, 1929 and a chair, together with sketches for a garden bench (not executed) and a studio table (executed) which Van Doesburg all especially designed for the studio-house, design, 1930. The studio, kitchen and music room contain fixed tables in grey concrete. The tables in the kitchen and music rooms have yellow tops. The colour researcher Mariël Polman, who studied the use of colour for the Foundation for the restoration in 2003, concluding that Nelly probably had the tabletops painted. It is not known if the table in the studio was to be given a colour, though annotations have been discovered for the table to be painted red on top and blue underneath, and yellow or grey and white. However, it is not clear whether these are Van Doesburg’s own annotations. Other colour accents in the house are the tiled floors he designed for the bathroom, kitchen and library. They are compositions of white, grey, black and red, and of yellow, red and grey. The stained glass skylight in the library is coloured blue, orange and red. Otherwise the interior is primarily in shades of grey: the studio space has pale grey walls, a grey concrete floor and table, and a dark grey balustrade and panelling at the stairs. 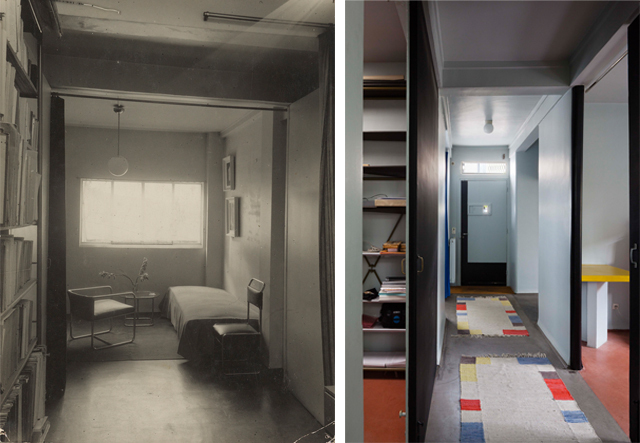 Sleeping room with furniture by Van Doesburg, at the beginning of the 1930s, and the hall on the first floor, 2012, photo Hervé Abbadie. “Without colour, architecture is without expression”, Van Doesburg noted. Abraham Elzas, who made the construction drawings, wrote in De Stijl and De 8 en Opbouw concerning the colour schemes for the Van Doesburg studio-house: “(…) the cupboards and tables in ‘varying colours’, the walls in ‘different shades of grey’ and rendered exterior walls with ‘mineral white paint’. Elzas associated the importance of the colours directly with the spatial and functional significance of Van Doesburg’s design: “In this house Van Doesburg implements his often-expressed idea: to abandon the ‘interior appointments?’ of a house and achieve a organic totality such that ‘appointments’ and ‘house’ are one. He specified the repetitive functions (cupboards and tables) in a house by including them as monoliths in the construction. By painting these cupboards and tables in different colours, he sought to give them ‘independent energy’, in order that together they would reveal that clear, pure atmosphere Van Doesburg considered to be a characteristic of a ‘visual interior’”. The studio, 2012, photos Hervé Abbadie. Polman argues that the clear simplicity to which Elzas refers is supported by the colours Van Doesburg selected. Having studied the colours, she has identified four shades of grey containing white and black pigments with varying additions of ochre yellow, synthetic ultramarine and Prussian blue. In the studio, the grey shades can be clearly experienced. Polman’s research reveals that most doors and the original steel window frames had been pale grey to start with. The black is from a later date. 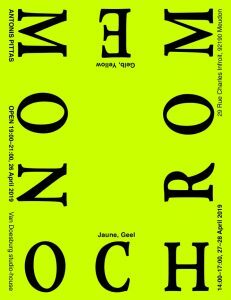 During the restoration in 2003 a balance was sought between Van Doesburg’s intention, the first execution, its evolution in Nelly’s day and the restoration history. The aim was not to create a conclusive picture and to avoid a biased interpretation. The recent 2014 restoration should also be seen in that perspective. In addition, the use of the house as a studio requires a practical approach, though it is not always straightforward to combine comfortable living with refurbishment in keeping with Van Doesburg’s ideology. On top: The music room and the library in open and closed situation, beginning of the 1930s. 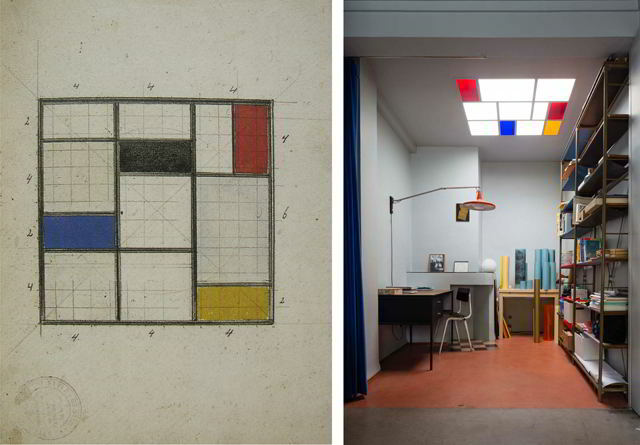 Below: Drawing of the skylight, Theo van Doesburg, and the executed skylight in the library, 2012, photo Hervé Abbadie. The design of the studio-house constitutes a great contrast with the interior of L’Aubette on which he was working at that time. In Polman’s view, L’Aubette exhibits a typically painterly approach with overwhelming colours resembling a Gesamtkunstwerk. On the other hand, the studio-house is mainly grey and white, with, here and there, a varicoloured floor and a colourful stained-glass window. It has taut, white external walls with discreet colour accents in red, yellow and blue for the doors and the garage. Polman wonders if the visitor, the artist, is aware or unaware of the fourth dimension in Van Doesburg’s creation, as he himself envisaged. 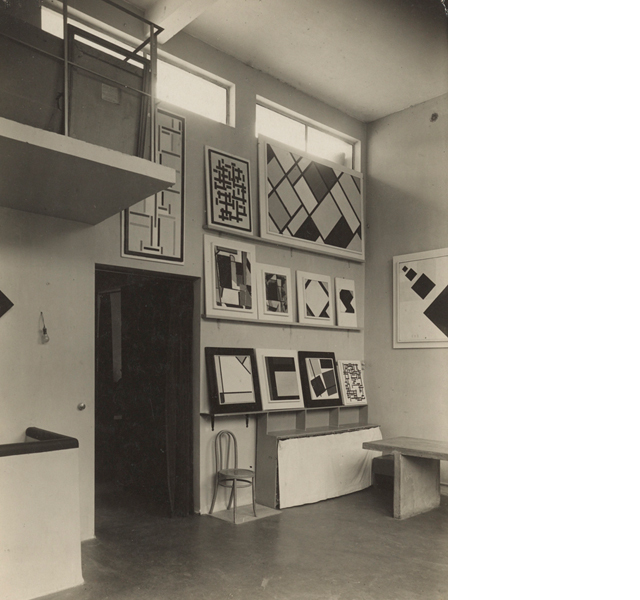 Is the artist involved in the oneness, in Van Doesburg’s attempt to create a meeting place where art could come about, thrive and be discussed? 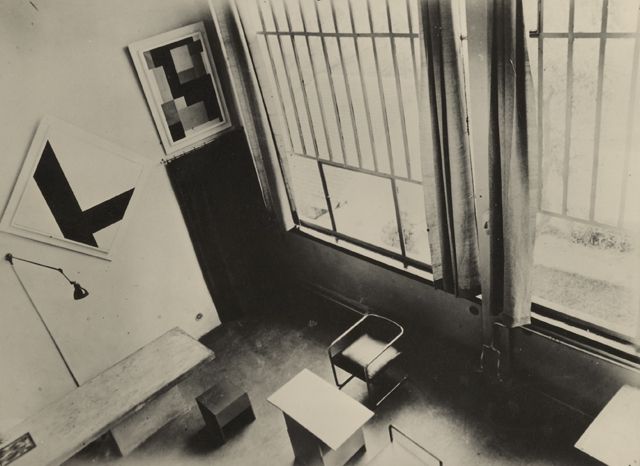 Or, as Matthias Noell suggests in his recent study of the Van Doesburg studio-house, did Van Doesburg deploy the studio-house as a means of self-representation: from bohemian in the early twenties to engineer, and even laboratory technician at the end of his life when he designed the studio-house? The studio, seen from above with the concrete built-in table, 1930s.